Some subjects offered are “Recognizing Horse Behavior and Applying Effective Strategies”, “Horse Psychology on the Ground and in the Saddle”, “Pre-Ride Checklist: Preparing You and Your Horse for a safe Ride” and many more! According to RJ Sadowski, Horsemanship is an art form. It takes creativity, rhythm and seeing existing concepts in a new way. RJ will be the first to tell you that he has not discovered or invented any new concepts that did not already exist somewhere in the field of horsemanship techniques, science or psychology. 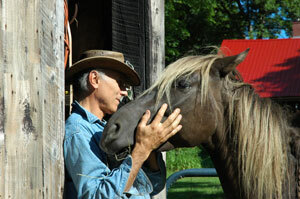 What he has done is created a different approach to helping people find a different way of “being” and their horses. He uses psychology, horse behavior indicators and strategies, natural horsemanship techniques and even the function of mirror neurons. (For more about this, type “mirror neurons” in your browser). The program starts with first understanding and taking care of the horse’s hierarchy of needs: safety, comfort, food and play. Horse owners develop a strong sense of “being with” their horse and using “timing and feel” for effective communication. The language and communication is further developed by determining what the horse is feeling in the moment and then using only those specific strategies that are effective with that horse at that time. “These concepts and methods are far beyond just horse training and more of a “state of being” with a horse on the level of where the horse exists” says RJ. For many horse owners, having and developing a safe and respectful relationship with their horse is the ultimate dream. Peace Haven Farm HorseMindShip™ has been holding Seminar/Demonstrations in Goshen/Plainfield area with members of the Hampshire County Riding Club and several rescue facilities and others from outside the club. He travels throughout New England, as well as, CT, NH, NY and FL for Workshops and Private Sessions. Some themes of these Events were “There is no Off Season for Horses: An overview of Horsemanship”; “Wild Horses: Fear and Truth Revealed Through the Mustang”; “Foundation for Horse and Human”; “Horse Psychology for Relationship Building”; “Understanding Horse Behavior” and other exciting topics. These are fun and powerful Educational Events. The format of these Educational Events during the winter months is more of a Seminar/Demonstration where the concepts are presented in a warm facility near a fire with several one hour sessions outside demonstrating the concepts with horses. There is always positive feedback from participants who were excited and enlightened by the concepts presented. The object of the program is to teach the concepts of HorseManShip and show folks when, why and how to advance their relationship and skills with horses. These concepts and this approach are very empowering to the horse owner and confident building for the horse. RJ has a long history in education and horsemanship. He has a BA in Education from the University of Mass and worked for twelve years as a Certified Massachusetts school teacher in the public elementary schools in Williamsburg MA. He also worked for twelve years part time teaching communication skills to adults in business seminars. RJ has spent over thirty years studying natural horsemanship techniques, principles, philosophy and methods via videos, and publications by Tom Dorrance, Ray Hunt, Buck Brannaman, Monty Roberts, John Lyons, Chris Cox, Dennis Reis as well as participated in Clinics with world famous names such as Craig Cameron, Clinton Anderson, Lynn Palm, Martin Black, Pat Parelli and others. He has also spent countless hours observing herd behavior, learning how horses interact with each other. He has strong talent in subjects such as Horse Behavior, Horse Psychology, Round Penning, Colt Starting, Gaining Respect on the Ground, Riding with Confidence and Gaited Horses. He has traveled around the United States to attend intensive schooling with some of the world’s most famous clinicians and horsemen and holds certificates in Liberty and Horse Behavior, Fluidity Freestyle I, Fluidity Finesse II and Advanced Horsemanship Techniques. RJ also lived with a Tennessee Walking Horse stallion for 4 years for breeding and riding. His qualifications have led him to be chosen as an Official Mustang Heritage Trainer and foster home for wild horses. HorseMindShip™ is an exciting and refreshing program and a resource for help with starting colts, gentling Mustangs, ground exercises to prepare for safe leading, mounting, development of lightness and suppleness, control of horses’ body parts and teaching skills of bridleless riding. It is a complete program from beginner to bridle less; colt to finished horse. RJ enjoys helping horses and helping people with horse problems. Most, if not all, misunderstood horses are caused by mishandling by humans. He has formed the program to help the horse and owner to be safe and develop a valuable relationship with each other through communication. He makes it known that his primary mission is helping people to develop a relationship with their horse and to know whether or not their horse is safe to ride. This is done by installing what he calls a “solid foundation” not just for the horse but also for the human, using a “Pre-Ride Test” that he has developed. The “Pre-Ride Checklist”, in a few minutes, can show readiness of horse and rider to ensure a successful ride or ground experience. RJ’s gentle techniques produce dramatic results with any horse, any discipline, any breed and any age. You will be sure to improve your horse’s willingness and your safety and riding skills as you feel your knowledge and skill grow to new levels. Be sure to sign up for the Peace Haven HorseMindShip™ e-Newsletter to be up to date on Day Classes, Seminars, Demonstrations, Clinics and Workshops taking place in your area and at Peace Haven Farm. The 2016 schedule is filling up fast.